Summer 1956. I would be three years old in October, Wearing a simple one piece sunsuit, with shoulder ties and elastic gathers around my waist and upper legs, I was running around the yard in my white sandals that buckled on the sides. I was cute as ever and precious as could be. Curious, I began walking towards the sound. As I got closer, the sound grew louder. It was coming from our covered carport. I saw Daddy’s pant legs and shoes. The rest of him was underneath our car. That noise was Daddy hammering. Stepping onto the cement, I walked towards Daddy. Suddenly there was a thud, a yell, and words I’d never heard before. Daddy didn’t seem very happy. Then a long silence…both Daddy and me. He grunted and groaned, and I watched him awkwardly making his way out from underneath our car. Clearing the car frame, he ducked his head and pushed himself the rest of the way out from underneath the car. He was sitting in front of me, and I was standing in front of him. We were eye to eye. His brown eyes staring at mine–my brown eyes staring at his..
My brother Bobby (4) and me almost (3). At Grandma and Grandpa’s house. Bobby (4) and me almost (3). I don’t recall saying anything. I was caught up in my own toddler moment of feeling safe and loved in his embrace. Daddy kissed my forehead and hugged me again; right before, I ran off to play. This is one of my earliest memories. I felt so loved and cherished by my Daddy. The last time I saw my Daddy, he hugged me tight, gave me a kiss and said, “I love you, darlin’.” I hugged him tight and replied, “I love you, Daddy.” I’m thankful for the wonderful memories God allowed us to share together before Daddy went to Heaven on March 22, 2016. Happy, happy times and smiles. Great Grandpa with his first Great Grandchild, Beaux. Precious Parent, Precious Believer in Jesus Christ–just like a little three-year-old girl was watching and listening to her Daddy–people are watching and listening to you and me everyday. Let us remember this powerful God verse truth. “We are surrounded by a huge crowd of witnesses to the life of faith.” People are watching us. God can and wants to use you and me to impact the people around us for His Kingdom for eternity. LET US RUN WITH ENDURANCE THE RACE GOD HAS SET BEFORE US. 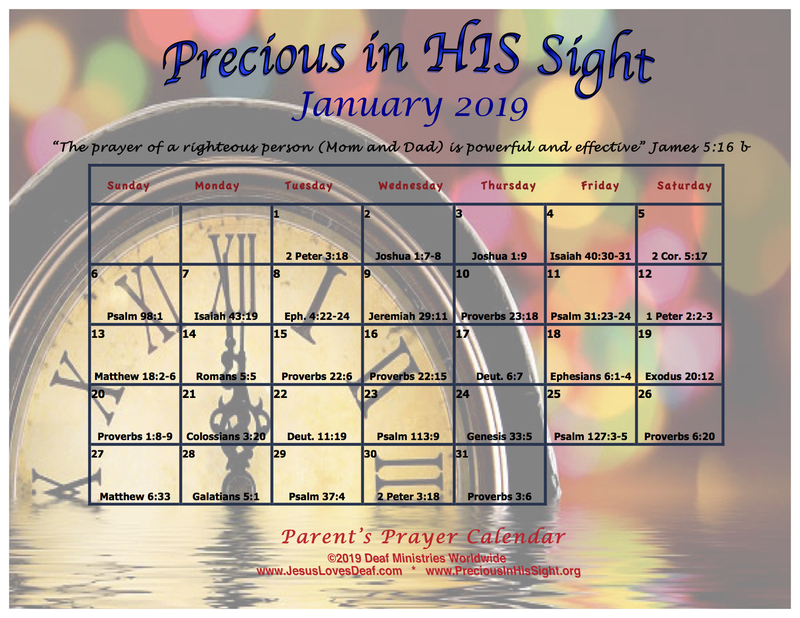 The Precious in HIS Sight Prayer Calendar for JANUARY 2019 is a tool for you and me to use as we pray for our loved ones. The Calendar has helped me faithfully pray for my family through the years. Click on the Calendar and it opens, enlarged in a new window making it easy to read the Scripture references. Look up the Scripture reference for the day in your Bible, and turn the verse into a prayer for your loved ones. I print the Calendar and keep it in my Bible. I encourage you to do the same. I have seen that Scripture Prayers are powerful! they are a reward from Him” Psalm 127:3 (NLT). MAY GOD USE YOU AND ME IN GREATER WAYS TO LET OUR CHILDREN KNOW THE TRUTH: THEY ARE A GIFT FROM THE LORD TO US AND A REWARD FROM HIM. IT WILL BE A GOD BLESSED NEW YEAR! Previous Post Moving back to where it all began!